The various Arisaemas are all in full bloom for me right now. I love going out to the shade garden and seeing these bizarre aroids coming up amongst the various hostas and other shade plants. Arisaema triphyllum is the most commonly encountered species, and also probably the easiest to grow. Nearly everyone who's spent time in the woods is familiar with Jack in the Pulpit. There's quite a bit of variation between populations, some spathes being green and some being purple. Also there is a form with white veins called 'Starburst', and a form with black leaves called 'Black Jack'. Additionally there is a large form, growing up to 30" tall with leaves 24" across! 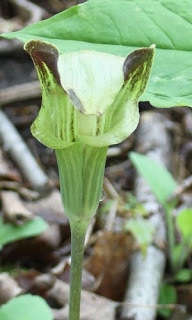 Arisaema draconitum is a less well known native. It has done fairly well for me, but is not very showy by itself. I think a colony would be more effective than a single plant. Arisaema sikkokianum is probably the next most well known, and definitely the most coveted by gardeners. It's incredibly showy, no description I can give will do it justice. There are some forms with silver-centered leaves. These have not performed as well for me as the solid green leaved forms. It may be just coincidence, but I've lost 3 silver forms and not a single green form. Arisaema serratum hasn't been very showy for me so far. I think I need to improve the soil for it, since it should get almost 3' tall and hasn't gotten taller than 15". I have seen this species looking fantastic in other gardens. Arisaema ringens has big, glossy, plastic-looking leaves and interesting purple spathes. This species has been easy to grow and hasn't failed to impress me so far. Arisaema urashima is maybe the most bizarre species I'm growing. It has a beautiful purple spathe, and from inside a whip-like appendage extends to 18". 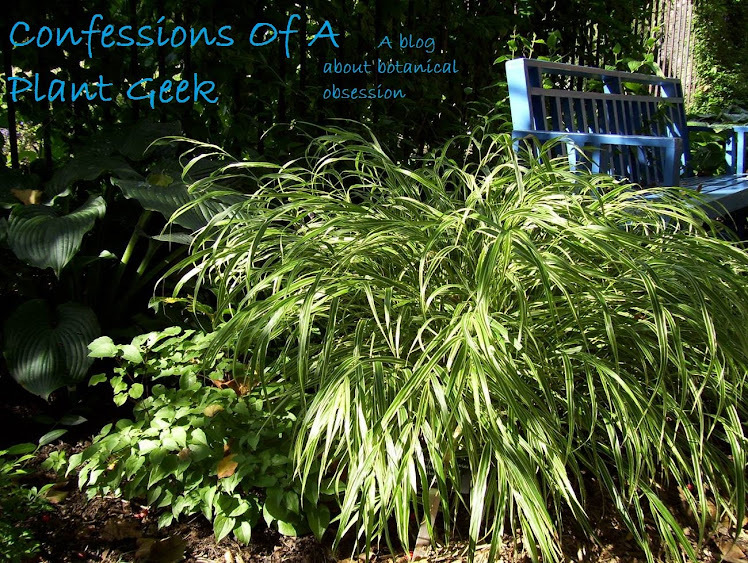 This has also been easy to grow, and can tolerate dry shade.